Listening to music is supposed to be an emotive experience, but it’s not often you have the chance to sit through a performance as introspective and heartbreaking as Sufjan Stevens’s. 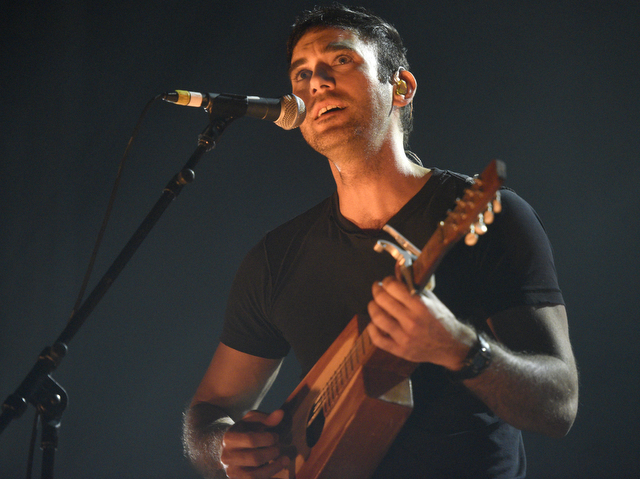 The indie folk singer starred at the Arlington Theatre on the evening of Saturday, October 24, with the latest stop on tour promoting his seventh studio album Carrie & Lowell — a record inspired by the loss of his mother, Carrie, in 2012. It was Stevens first time playing in Santa Barbara, and although his music doesn’t readily lend itself to sing-along choruses or dialogue between the band and audience, it wasn’t hard to understand what emotions and thoughts Stevens wants to convey through his songs. A particularly heart-wrenching moment came at the end of “No Shade in the Shadow of the Cross,” when he took a noticeable deep breath to steady himself — the song itself references his self-destructive behavior after his mother’s passing. The band played its way through the entirety of Carrie & Lowell over the course of the night, a touching tribute to Sufjan’s mother and step-father with meditative songs like “Should Have Known Better,” “Eugene,” and “Fourth of July” — the last of which expresses a bleak sense of fatalism and ends with the musicians thoroughly “sticking it” to mortality. The end result was a feeling of familiarity and a strong sense of catharsis. Losing a loved one can be a trying ordeal, but sometimes it can bring out the best in us, as it has with Stevens.